This is the West Ham United Football Shirts shop at Soccer Box. If you are looking for official jerseys make this your 1st stop. The hammers have never played below the 2nd tier of the English League and currently plays in the top-flight, the Premier League. 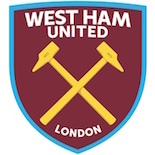 West Ham is based in East London and has a loyal fan base in the South East of England. Large numbers of match tops and can be seen in the area on match day, along with accessories and merchandise. The team’s supporters are loyal and proud of the club flaunting their support with all kinds of merchandise. When you visit our official shop you are sure to find a large rang of official merchandise from shirts, jerseys short and socks to a very good range of genuine souvenirs. No matter what you age be it a small child or an older adult we are sure to have something for you. Shop for official West Ham United Jerseys at Soccer Box. The tops are traditionally claret and sky blue in color. This color scheme is now iconic of the club, however, the first tops worn by the team were dark blue. Before settling on the now popular claret and sky blue theme several alternative color shirts were trialled including a sky blue and white shirt. The claret and blue tops worn for all home games have inspired the design of the accessories collection. The official West Ham United shirt is great for wearing on match day, but the official accessories and merchandise can integrate into every day life, allowing you to exhibit your team allegiance at home, in the office, at school or in the car. Standard supporter’s merchandise includes the infamous scarf. You can visit our shop for a large range of merchandise at Soccer Box, but why not browse our extensive selection of accessories where you will find many more ideas. For use at home or work the ceramic mug is a great choice and makes a perfect gift for any soccer fan. You can even kit your pet out with merchandise, we stock dog leads and bowls as great accessories for your canine friend. Or accessories for your feline include the WHFC Ham cat bowl. If your kids are keen fans you can stock up on accessories to keep them happy. Why not shop for merchandise that will transform their bedroom into a supporter’s haven. A quilt cover, clock and soft toy are all fantastic accessories that will brighten up any bedroom. Also great if your youth is a fan of the hammers, we stock merchandise that is perfect for use at school. A backpack and accessories such as stationary and a water bottle are essential for school, and designed in the official club colours theme your kids are sure to love them. Football merchandise and accessories also make great stocking fillers or birthday gifts. The West Ham home Kit and accessories are most prominently on display during every home match. The team currently play at the Boleyn Ground but will be relocating to the Olympic Stadium for the start of the 2016 - 2017 season. The new stadium will house a larger capacity of supporters decked out in their Claret shirts, accessories and related merchandise. Bookmark our shop for all your official West Ham United jerseys and accessories!